I don't like the feeling of seat belts on my bare skin in the summer nor do I like the edge of the seat belt chafing my winter sweaters, sooo... seat belt covers are in order! 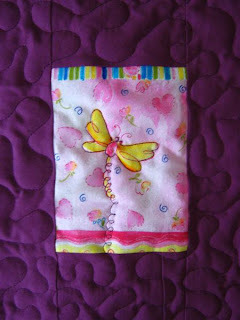 I thought one up, it worked, so now I'm "mass producing" :) Thought I'd share, they're quick, useful and pretty! 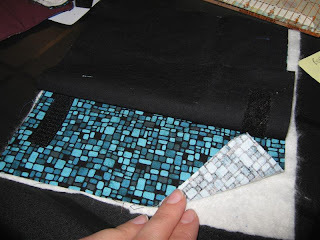 I don't mind cutting into favourite fabrics as they are the sole focus of each piece. 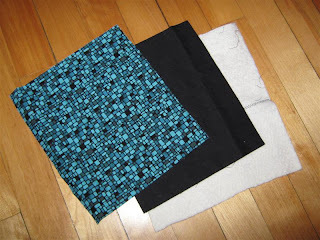 I picked one of my favourite fabrics for the outside (which you see the most of), simple black cotton sheeting for the inside and bamboo/cotton batting - any batting will do. 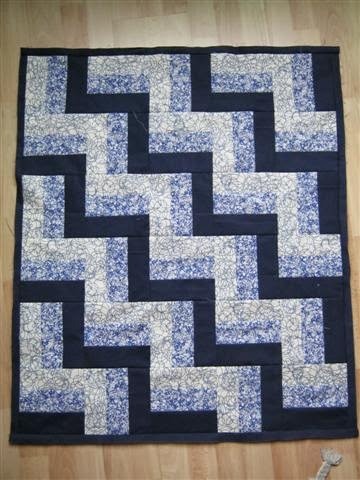 I pieced together leftovers with a zigzag stitch. 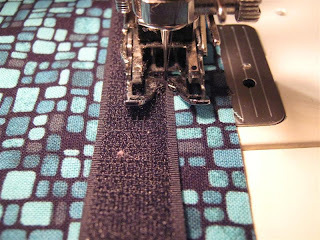 Sew the scratchy velcro strip 1/2" from the 8.5" long edge of your outside fabric (center it between the top and bottom, right side up, see pics below), and sew the soft velcro strip to the 8.5" long side of the inside fabric (also 1/2" in from the edge). 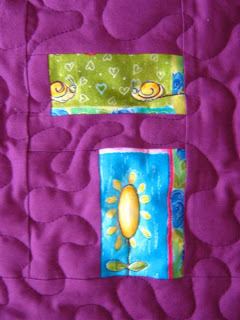 I backstitched at the corners for added toughness. 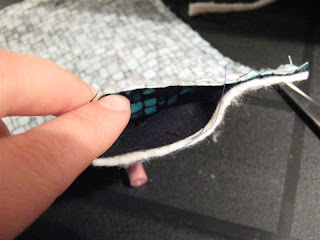 Layer as follows: batting underneath inside fabric (face/velcro strip up), underneath outside fabric, face/velcro strip down, velcro stip on opposite side from the one on the inside fabric, see pic below. 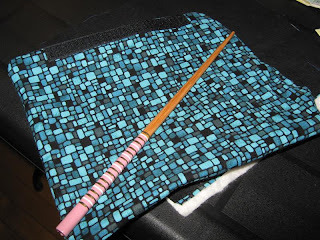 Note that I have my outside fabric next to the batting here - it doesn't really matter either way, though I switched mine around, just personal preference. 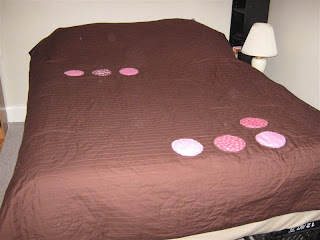 Because I used bamboo/cotton batting, I didn't bother pinning my layers together - the batting stuck to the fabric - you can pin if you want to, and should if you're using polyester batting. 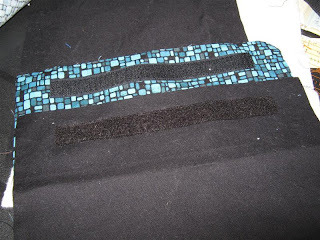 Sew a 1/4" around the whole perimeter, starting in the middle on the 7.5" long side (between the velcro strips) and leaving a 2"-2.5" gap for turning. 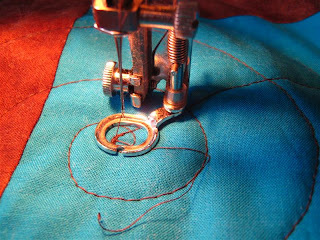 Backstitch at the start and end to secure your seam for the turning process. You end up with a nice sandwich, notice the gap near the top corner. 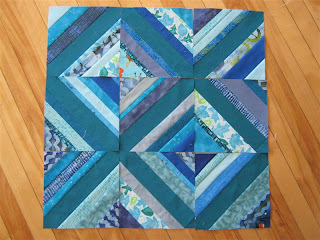 Trim off excess batting, especially at the corners. I also clipped my corners to make the turned out corners less bulky. 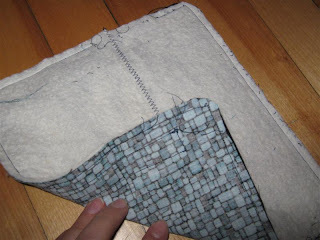 Turn the sandwich inside out between the two fabric layers - I find it easiest to start with the nearest corner, then alternate pushing and pulling the bulk through gently. I push the corners out with my fingers first, then use a chop stick to make them as pointy as possible. 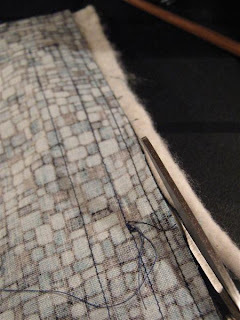 I also slide the chop stick tip along the edge-seam from the inside, to push the seam out as far as possible for the framing. 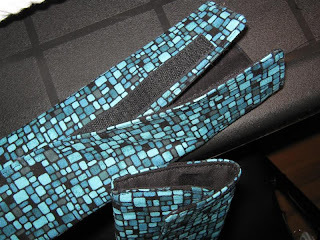 Oops, I guess I forgot to take pics of the framing process... starting just past the opening/gap (so that you can still get the chop stick inside and push out seams), sew about 1 mm from the edge to secure the edges and "frame" the sandwich. 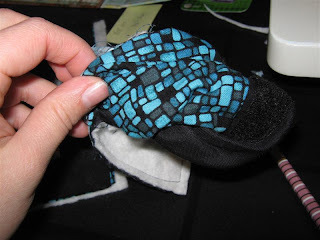 Go all the way around until you get to your seam, turn the loose edges in about 1/4" or however wide your sandwiching seam ended up being. 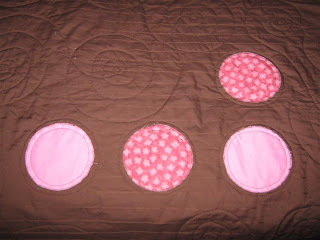 Use a seam ripper or pin to help you push the fabrics in just right. 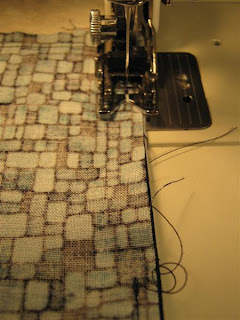 Continue frame-sewing over it, that'll close up your whole without any handstitching necessary! Tadaa - a beautiful and useful gift for yourself or others! Well, I made it! One quilt for my darling friend finished! 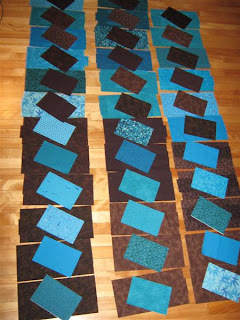 Here's part of the matching and layout process, all the blocks are cut and ready to assemble. 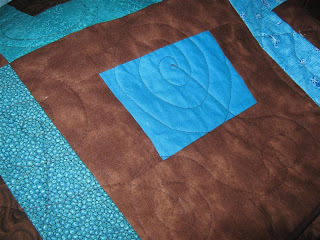 Big spirals make for fast quilting! 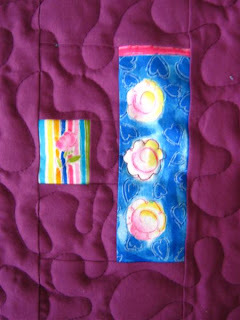 I ended up incorporating a bit of pink on the back, since my friend loves the colours pink and turquoise. 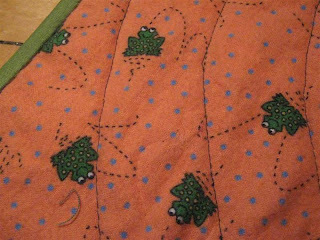 The print in the middle is an adorable froggy print - I found one lonely fat quarter at a general store (everything from camping gear to kitchen utensils to fabric) in Victoria, BC - who'd have thought??? 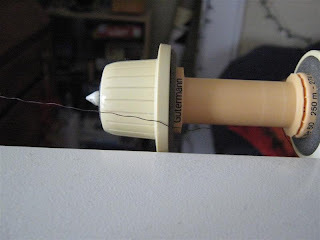 ... my thread ran out. How often does THAT happen??? 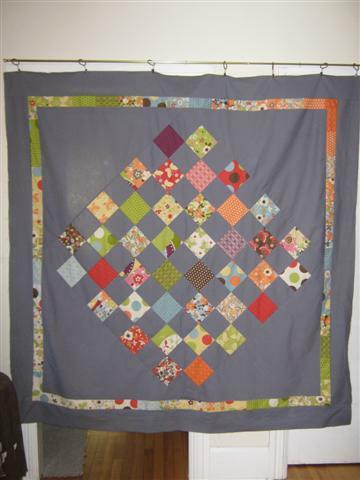 But one thing I've learned last year: I seem to enjoy making quilts a lot more than I enjoy using them :) Lucky friends and family of mine, eh? 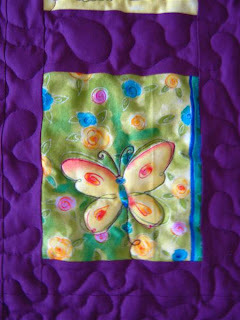 Mal of Turning*Turning who writes about art therapy (her profession) and is bubbling over with creativity. I know she hasn't posted in a while, and it's been quiet on the email front, but I hope she's still in action! Rebekah of Don't call me Becky - ah, another of these really creative people, a pro at quilting and knitting (and likely many other things, well, I can think of travel-cataloguing for one thing!) 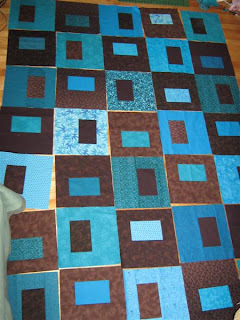 who has given me many ideas for projects through her blog. 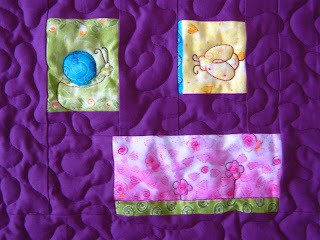 Nichole from Nichole in real life who makes fun quilts and whose taste in colours and fabrics I also share. 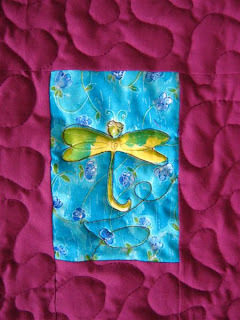 Heather of Quilting like crazy - because somehow I always feel energized after reading her blog. 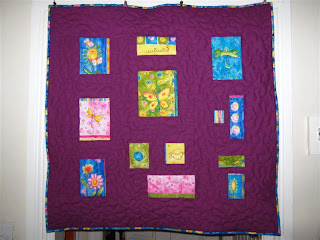 Great quilts, too! 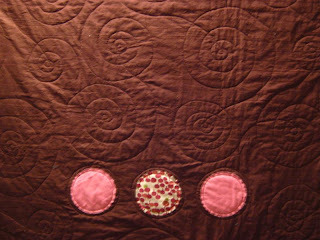 Melanie of Melaniemade - one of the first quilting blogs I read and whose blog and work I enjoy immensely - she does some crazy quilting stuff, always very large and involved project it seems. 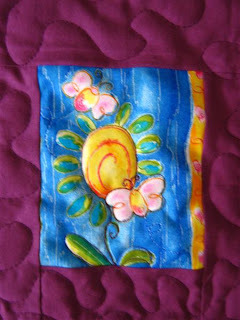 Crispy of Crispy Quilts who does totally different quitling stuff from me (traditional applique, hand-piecing, hand-quilting), and that's why it's so interesting to read her blog! Plus, she's so quirky :) It's fun to read her stories! 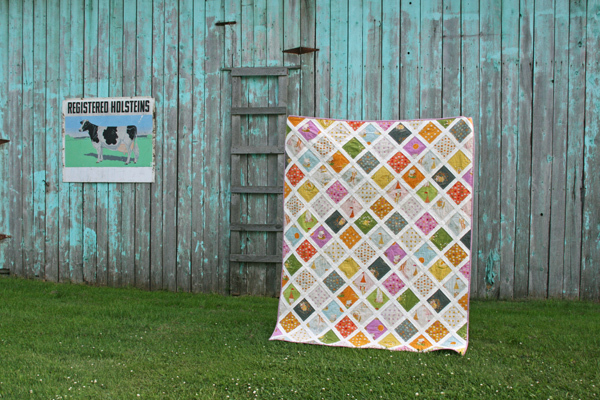 Anne of Film and Thread who inspired me to make an unbalanced/non-blocky quilt, namely my Imagination 1, with her quilt for Sophia. So, hopefully I'll have time today and tomorrow to let all these lovely ladies know they are nominated for an award! 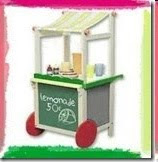 I've been nominated for a blogging award, a Lemonade Stand Award, to be specific! How exciting! 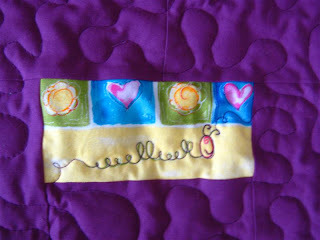 Leslie of Fluff&Nonsense thought me worthy - thanks so much Leslie! 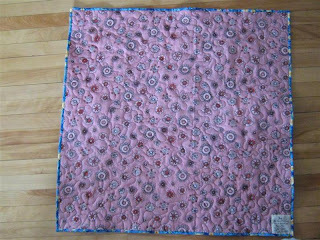 I also got very warm and fuzzy on the inside when I read the nice comments Nanci of Quilting at the Cottage left on Leslie's blog post! Put the Lemonade logo on my blog or within my post. Link the nominees within my post. Share the love and link to the person from whom I received this award. So, I'm definitely accepting the award. I've done the log and linked back to Leslie. Now I'm going to pick 10 worthy blogs, but they probably won't be posted until this weekend. 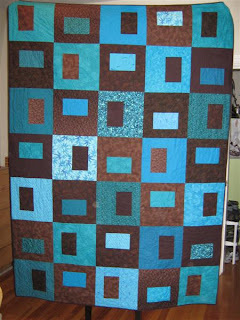 So stay tuned for that, and also an update on the brown-turquoise quilt! 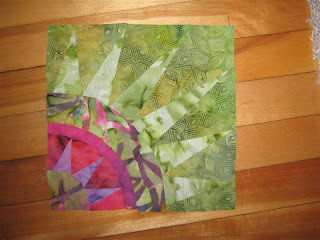 I pried my hands off that one, so I can give it away as planned - it turned out so well! 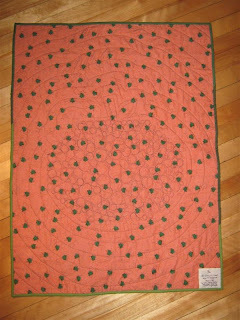 This quilt I started on Dec 29th and finished on the 31st - that felt good! 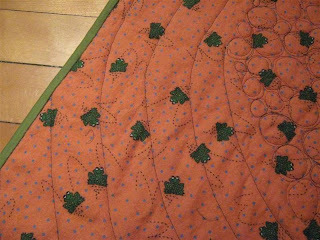 I've had the butterfly/bug fabric featured on the front for a quite a while, but was lacking inspiration until a friend of mine mentioned she needed a baby-quilt and the mother likes butterflies! 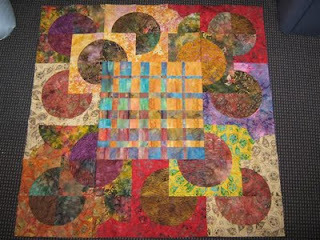 I did a large meandering background quilt pattern to keep the quilt soft and fluffy, but in each block, I outlined a theme. 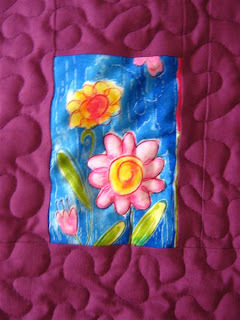 The background is a girly floral/swirl flanelette. I've had a productive switch-over from 2009 and 2010. 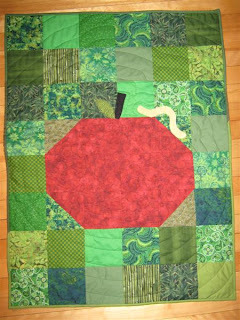 I echo-quilted around the apple/leaf/stem/worm, quilted lines onto the worm and pebbled the apple. 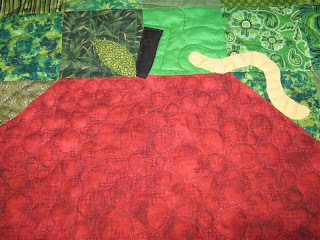 I consider this quilt done, but if the fancy strikes me, I'll add a face to the worm... maybe. 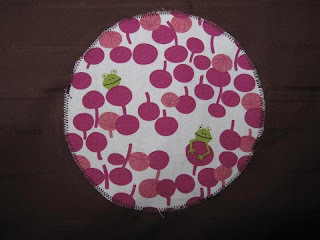 Found this cute bouncing-frogs flanelette for the backing, bounce, bounce! I finished two more quilts, and you never guess which ones because I hadn't really started them yet ;) Stay tuned!